My computer has been misbehaving a bit the last day or two; I'm not sure if it's in reaction to the new external hard drive I installed or to the fact that I'm running out of memory (which is WHY I added the hard drive). So yesterday I moved all my photos onto the new hard drive and then set about deleting photos from the main drive that weren't strong enough to justify keeping them in plain sight. Usually I start this process at the beginning of my alphabetical list of folders, and tend to lose momentum towards the end, so this time I decided to work from the bottom up; poking through the files, looking at everything, tossing the losers and pulling out the ones that called to me. I found this one in a folder labeled "wood, stone, rust and sand." 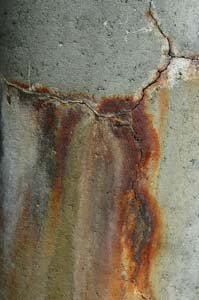 It was, I believe, some sort of cement pillar or piling on a beach in Poulsbo, and I took the picture because I loved the colors: this sort of gray blue/green and rust combination is a favorite of mine, and dominates the room where I do my morning meditation. It wasn't til I got this image home that I realized it looked like a figure doing some sort of rain dance. I labeled it "medicine man," and then stuffed it in a file and forgot about it. Yesterday, looking at it again, it felt a bit like a crucifixion, this figure with upturned face and raised arms. Is it begging? Is it dancing? Is it raging at God? I don't know, but I love the ambiguity of it; love that I don't have control over what it says to a viewer. That's part of the joy I find in photography: that if I listen carefully and am obedient to the impulse that suggests "take this shot, this image, now" then I don't have too much control over the results, and they can just be what they were meant to be. Which is a good thing, because in other areas of my life I tend to need a lot of control, and get a little anxious when things begin to feel out of control. I suspect I am not alone in this: I'm in the final stages of rehearsal for an upcoming play right now, and I can feel the whole cast -- not just me -- getting increasingly frantic, worrying that it may not come together. Because, of course, whether it comes together or not is not under our control: that's the director's job, and all we can do is perform our parts faithfully. Kind of like life, I guess: Clearly we're not the director on this stage, either. And while some of the scenes seem pretty easy and straightforward there are others that are just incredibly complex, with lots of players, or lots of hidden motives. And sometimes we don't get the role we want, and the one we're stuck in feels all wrong, or the other players aren't giving the expected cues and we just want to cry out in rage, like this figure. And then there are the other times, when everything goes well, and we are exultant, awash in applause -- and that sense of celebration is contained in this figure as well. And now a voice in my head, steeped in years of listening to Monty Python, is proclaiming this (probably mangled) quote from a ridiculous interview with a famous but obviously brilliantly stupid actor: "The words are all there; you've just got to get them in the right order." All the possibilities are here, contained not only in this image, but in each moment. Our job is to keep plugging through and trust that Someone, Somewhere, gets the Big Picture. Though the weatherfolk had predicted rain, yesterday was a bright and blustery day here, and the sun so warm that we decided to cut my husband's hair outside, but on the front deck, away from the chilly north wind. After the haircut, I headed into my new office to tackle some more filing, and he went upstairs to shower off the loose hair, and I heard his voice call, "Dear!" It was a lovely bright sound, full of promise, and I immediately began trying to imagine what he might be bringing to my attention. "Look out the window!" he called, and then I knew: the mama goose who has been nesting at the end of our boardwalk had finally hatched her goslings, and they had begun their traditional habit of grazing in our driveway. Sure enough, I looked out the window and there they were. There are only three goslings this year; I don't know if that means the eagle that nests in the tree across the lagoon has already gotten the others, or if this is all there were. But it was a joy to see them once again, and to remember the spring we spent on Shaw, nursing a gosling (whom our daughters named Kiwi) which had been abandoned by its parents after having been abducted and dropped by an Osprey. Kiwi had gone for rides in our car and walks with our dog; read books with our children and slept on my husband's toes while he sat at the table reading. 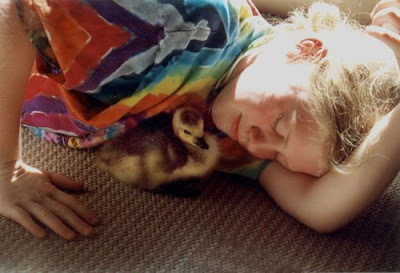 So when I see that adorable yellow fuzz, I remember what the fuzz feels like under my hand, and long to tell the goose parents that I, too, have raised and protected a gosling. But of course, when I go outside and call to them -- "Kiwi, Kiwi!" (in case by some odd chance our goose, who flew away when he was grown, might somehow have found us here, or told his friends how hospitable we were) -- they back away, shepherding their babies into the water to paddle back to safety. Kittens, goslings, the baby swallow we rescued from our cat yesterday and set back into the tree -- all of them arouse these protective instincts, these "warm fuzzy" feelings. But the cat who now whines constantly outside my door is a kitten no longer, and her constant cries for attention are merely irritating. 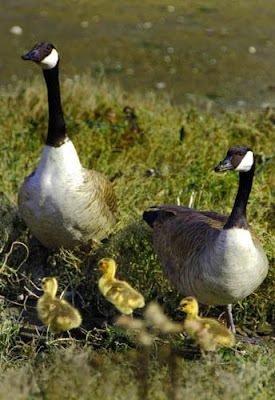 The grown geese can have a nasty peck, and their constant squawking in the wee hours of the morning is an irritating wakeup call -- not to mention what adult goose poop does to lawns and docks. The swallows make a mess with their nests, and their noisy ministrations in the gutter outside my daughter's window keep her awake at night. Why is it so easy to love the young and the innocent? And what is it about chattering adolescents, SUV-driving adults, and querulous and demanding elderly parents that irritates us so? And how is it that God finds all of them -- and us -- as dear and precious as these three fuzzy little goslings? Yesterday afternoon I attended a gathering of women artists at our local Episcopal church. We had all been part of an art exhibit at the church, and were there to take down our work and talk with one another about what had gone into the creative process. I go to the early service at this church, which is very sparsely attended, so I only knew two of the women there, and not in the context of the church: one I'd been in a play with, and one whose house I'd once visited for an artists' luncheon. But after drifting from conversation to conversation I found myself chatting with a sculptor who, like me, had grown up on the east coast. Both of us have been in the Northwest for 20 years or so, both of us miss the east, and neither of us would choose to move back there. Both of us have husbands for whom church is not the priority it is for us. So we discovered a number of connections in the course of the conversation, which was lovely, and paved the way for deeper discussion. She spoke of the long complex process of sculpting, of the relationship she builds with the stone. And I found myself trying to explain what it is that happens sometimes, when I raise my camera to my eye to frame a photograph; that voice that says "Take this picture." 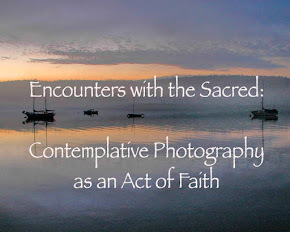 Later that evening, chatting with my husband over dinner, I retraced the tracks of that conversation, realizing as I spoke that since I began this blog I have begun to be less random about my photography, not shooting for the heck of it but more in response to a specific imperative. 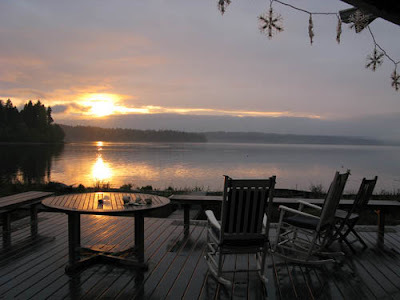 As if on cue, the sun appeared briefly in a sky that had been overcast all day, sending a bright beam over the water onto our wet deck. I excused myself and ran for the camera, explaining as I left that I needed to respond to whatever was calling. I shot several images, but this was the first and best, the closest to what I saw out the dining room window. It's a picture full of peace, and of memories: the chairs gathered as they were for friends who recently visited; the shells on the table the ones they collected while walking the beach; the snowflake lights overhead left over from Christmas. It was only a moment, and I returned to the table. But it was a moment that contained much joy: the conversations with friends, with the sculptor, and with my husband; the peace we find living here; the rain and the clouds of spring; the mango sunset from the book at my bedside... And I'm not sure it needs any more than that. After years of practice, you would think Centering Prayer would be easy. After all, it's so simple -- see a thought or feeling bubbling up? Let it go. Here's another? Let it go. But what if it's important? Let it go. This morning I was reading a wonderful Anne Lamott passage, about teaching a Sunday School class for pre-schoolers. She was explaining the Wailing Wall to them, describing the practice of writing your concerns down and stuffing them into the cracks of the wall. The lesson, she said, was about letting go. "What does letting go mean?" I asked. The boys looked around at one another, worried as cats. "Let me show you," I said, and gripped two colored markers, one in each hand. "what if, when we go in for our snacks, someone offers me a juice box, and I won't let go of these pens, even though I'm thirsty?" I told them to watch, and you'd have thought I was doing a magic trick as I slowly unfurled my fingers and let the markers drop. We all thought hard about this. "So why would you want to let go?" I asked. One of the six-year-olds answere, "Because you're thirsty?" "Bingo!" I cried. "See, sometimes, if you're lucky, you get to a point where you're sick of a problem, or worn down by tinkiering with it, or clutching it. And letting it go, maybe writing it down and sending it away, buys you some time and space, so maybe freedom and humor sneak in -- which is probably what you were praying for all along." It's such a perfect illustration. Because we are always thirsty for spirit. But we get so caught up in holding on to what we WERE doing, or preparing for what we might want to do next, that we don't see the cup of life that is being offered to us in each moment. so hungry for your love. the concerns of the past. of our plans for the future. from the cup of now. 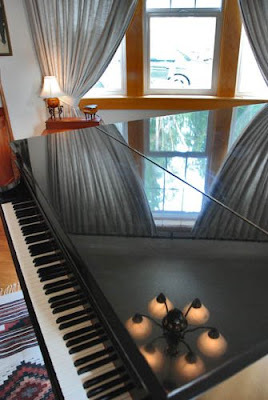 My mother was a classical pianist who escaped into the piano whenever life became stressful -- I particularly remember her pounding away at Rachmaninoff and Beethoven's moonlight sonata during my teen years. And though her own training was classical, she loved jazz and ADORED Dave Brubeck's classic, Take Five. She was, however, constitutionally incapable of either playing it herself -- the 5/4 rhythms, while she loved them, she found impossible to execute -- or of actually "taking five." She was a very impatient woman, always revved up, always doing something or going somewhere, churning to-do lists over and over in her head. Playing piano was the closest thing to downtime she ever took. My father, on the other hand, had club feet and an enormous capacity for "just sitting." Now granted, he worked long days and long weeks and traveled a lot, but my memories of him at home mostly consist of him kneeling on the floor steaming the backs off of his beloved stamps or sitting on the couch watching baseball and calling for mom to bring him his beer and potato chips. I grew up assuming I was more like my dad -- my mom often called me lazy -- and I remember thinking in a rather superior fashion, once I had a home of my own, that if my mother had figured out, like me, how to put her to-do lists on paper she could have saved herself a lot of churning. 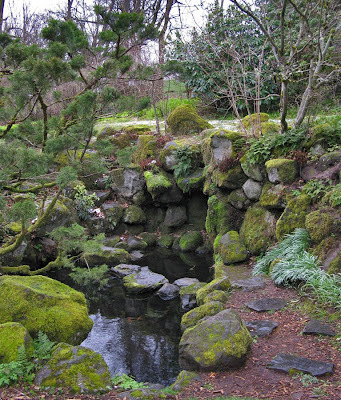 If you read this blog regularly, you may have noticed that in a couple of posts earlier this month -- A Time for Silence and Spring Giddiness -- I was struggling a bit with my apparent need to verbalize everything, getting messages to "Stop the words now." I was panicking a bit at the time, for fear I would have to stop blogging altogether. But as I sat in meditation this morning, exhausted after having spent all day yesterday moving into my new office, I was actually still enough to separate from all the whirling and planning that usually goes on in my head when I take time to sit down. 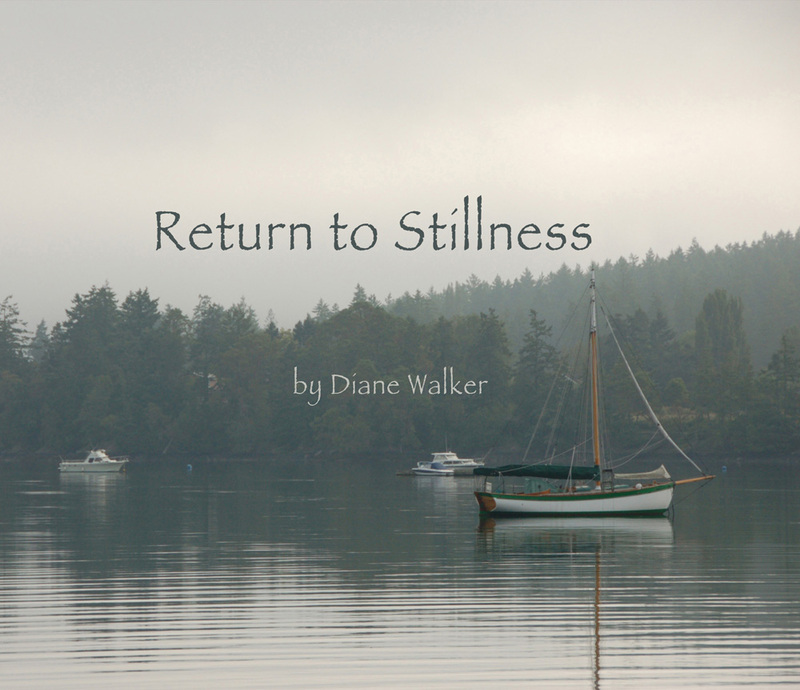 And in that stillness I realized that the gentle prodding to stop the words wasn't about blogging or not blogging. 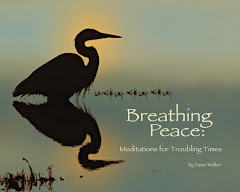 It was about not wasting precious meditation time on the blog. However like my father I might be in other ways, the energy and impatience that consumed my mother has also been consuming me. Whether or not I have learned to make lists, the fact is that something in me is always pushing forward and planning or moving ahead. And, more serious, something in me, despite all my training, tells me that I have no worth unless I am DO-ing. Hmm -- an old adage comes to mind: those who can, DO; those who can't, TEACH. If I were truly capable of just BE-ing, I would probably just BE. Instead I talk about the importance of BE-ing and don't hear my own messages. So I'm grateful I was tired enough to let go of all those thoughts and plans this morning, because the actual rest I got in today's meditation fed and restored me. And the message to shut up isn't about my not DO-ing something right. It's a loving divine presence reminding me to be patient, to sit, to restore myself, to take time to rest and heal. Listen to your own message, it says: you can't pour out of an empty cup. 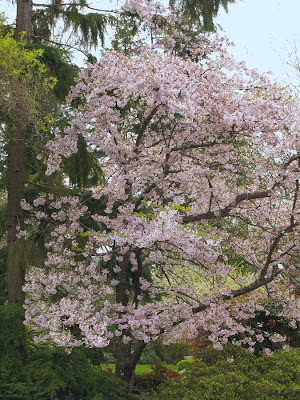 In the prelude to her latest book, Grace (Eventually), Annie Lamott says, "I knew that if you had the eyes to see there was beauty everywhere, even when nature was barren or sloppy, and not just when God had tarted things up for the spring." Though the temperature this morning was in the low 30's again, God has definitely begun "tarting things up for spring": you can hear it in the birdsongs, smell it in the air, see it in the delicious pale yellow-green of the trees that line the roadside. There is a feeling of release: people walk with a lighter step, the teenage girls are returning to their flip-flops, garage doors open and boxes are cleared away, sent to the dump, recycling, or goodwill. It all seems as natural and effortless as the appearance of the goslings on our beach: one day the mama goose is sitting on her nest at the end of our boardwalk, and then, sometime in the night, the goslings peck away their shells and the next morning they are paddling gently along the edges of the lagoon. If only birth -- and the rebirth of transformation -- were as easy for us. We look around us and see the exultant explosion of life and color and forget the long cold dark winter that nurtures all that color and light; much as a the soft burden of a new baby nuzzling a mother's breast erases most of the memory of the nine long months of waiting and the almost unbearable suffering of the birth process. It's only when we're in the throes of it -- the waiting, the birthing -- that it seems endless. And it's when the transformation process is at its worst that we begin to question why we ever began at all. As CS Lewis says in Mere Christianity, "I wonder what an ordinary baby would do if it had the choice. It might prefer to stay in the dark and warmth and safety of the womb. For of course it would think the womb meant safety. That would be just where it was wrong: for if it stays there it will die." From the outside, watching the pregnant woman crossing the street, or as the midwife assisting the birthing process, we have the eyes to see the beauty of what is happening and is to come. Watching our friends and our children struggle, we know with confidence that spring and rebirth will emerge on the other side of the challenges. It is only when the struggle is our own that we lose that ability to see. But I think we need that utter darkness, when all the familiar paths disappear, when we are totally lost, to learn that there is another way to see, another path to follow, and the soft invitation of a new dawn to light the way. We had a surprise snowstorm on the island this past weekend, and yesterday a dear friend told me she'd been out walking her dogs, escaping a rather stormy home environment, when the snow had begun to fall. 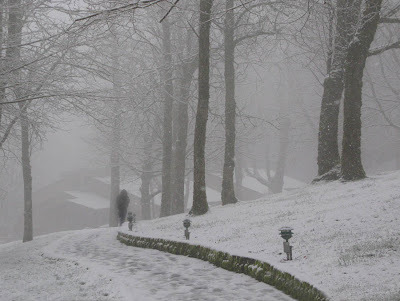 As she walked along, hot chocolate in hand, catching snowflakes on her tongue and reveling in that stillness a snowfall can bring, she found a sense of peace within herself that had long been missing. And though the storms at home continue to rage, the peace she found in the snow has stayed with her and made them easier to bear. "It's almost as if I had to go through the hard stuff, be willing to stay with it and be honest about it, to find the peace that lies beneath," she said. "Basically people are donkeys concerned only with the straw and barley they're eating until the presence of grace makes them otherwise. With faith, a grandeur embellishes humanity, as when with a little work by you, God enters a dry seed and makes a fresh living plant. 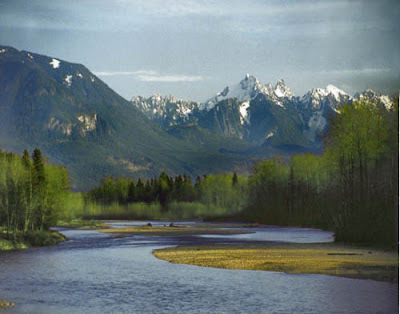 Every action becomes a part of this gift...Watch the sky moving, and see how every motion in creation connects with the creator..."
"Grief is better than happiness," he goes on to say, "because in grief a person draws close to God. Your wings open. A tent is set up in the desert where God can visit you. Wealth that arrives in grief is what we spend in joy. The soul is greater than anything you ever lost." Life isn't always easy, and sometimes it can be incredibly difficult to keep moving through the emotional storms that can swirl around and within us. But I believe that if we choose to stay with it, to step into it if necessary; if we remain conscious, pay attention, and do not anesthetize ourselves with any of the distractions we humans use to keep from facing our deepest anxieties and fears, there is a peace that lies within that will buoy us up and give us strength to face whatever lies ahead. Staying with it may not be easy, and often takes more courage than we think we have. For some of us, that courage never seems to be handy if we are thinking only of ourselves, but emerges only as a compassionate response to the trials of others: often we are willing to take risks on behalf of others that we could never justify if it were only our own concerns at stake. Which is one reason why the practice of tonglen can be so helpful: Breathing in, think not just of your own pain, but of the others experiencing similar pain. Breathing out, find whatever nuggets of peace or joy that continue to thrive within you, and imagine sharing them with your fellow sufferers. And awakened to the moment, we have the chance to breathe in that amazing silence, to taste the hot chocolate and the snow on our tongues; to know the sweet stillness that is God within. Drive slowly -- some of us walking alongside are lame!" "Today, like every other day, we wake up empty and frightened. So I think from now on I'll stay away from any attempt to discuss my art and just hope that the photos somehow illustrate whatever contemplative observations I may have to offer. That said, I just really wanted to post this image, the last of the bunker series shot last weekend. Because I like it. Nuff said? The last verse I read from Rumi this morning totally confirms the importance of what today's Thomas reading calls "taking a break from the Cosmos." With wandering talk it closes." Guess it's time for silence. This is one of the images I shot at the Port Blakely bunker last weekend. I always feel a bit odd about shooting other people's art -- it seems to me that if I were to sell one of these it would somehow be cheating. 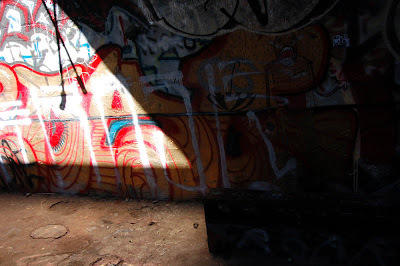 But I love the graffiti at the bunker, as it is always changing, and I justify the shots by saying they are a way of preserving moments in time; for all I know this particular wall has already been redecorated. Perhaps the test for whether or not it is right to capitalize on someone else's work in this way would be to ask if I would be resentful or envious if someone ELSE were to make money photographing the same thing. Because, generally speaking, the best clue to our own foibles and blind spots comes from that simmering bubble of righteous anger we get watching the behavior of others. One of my readings this morning questioned the difference between judgment and discernment, and I'm thinking this image could make a lovely test case for that. You can see where the two words might be connected: both involve a decision-making process and a way of knowing. But discernment seems to me to be more self-contained, while judgment involves an outward projection. If I am trying to decide whether a particular situation, job, relationship or course of action is right for me, that, I believe, would be a question of discernment, based on an innate sense of connectedness to a higher value and a larger community. Is it right for me to take this picture? Is it right for me to sell this picture? Under what circumstances might it be right? What if I sold it and used the money to buy paint, which I could then leave at the bunker for future artists? 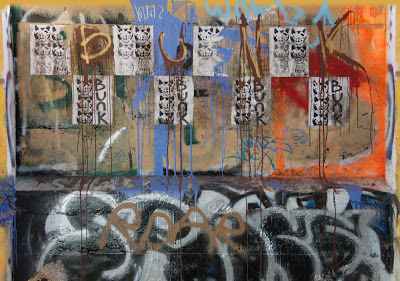 Or would that -- because I would be choosing colors -- be unduly influencing the artwork to come? But if I were to speak or act or think in a way that implied, whether directly or indirectly, that I or someone ELSE had made a good or bad choice, wouldn't that be judgment? Isn't the impact of that judgment a kind of separation, a building of hierarchies -- this choice is better or worse than that one, and the person who makes the choice is therefore more or less acceptable? And is it any less judgmental if I direct that decision toward myself or at someone else? What if someone else were to take this same photograph, blow it up really large, and sell to the Museum of Modern Art? Do I get all snarly at them for exploiting others' art, or for being clever marketeers? Or do I applaud their resourcefulness? Do I berate myself for being too stupid or insecure to have thought of doing that? Or do I applaud myself for choosing not to exploit the work of others? It seems to me that any of those choices would be judgmental -- and probably not particularly conducive to my own psychic health. All of which brings me to the question posed by this image in the first place. Is it true? 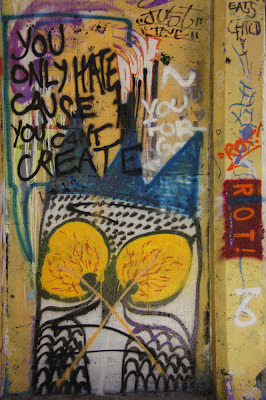 Do we only hate because we can't create? This is, I think, a huge question to ask, and could take way more time to answer than allotted in a single blog post. But if we accept that when we are creating we are delving into our own resources; expressing our own thoughts, feelings and observations in some way, shape or form; and are choosing to allow the creative force to move through us then creativity is, like discernment, a more self-contained process. But creativity also implies that we have control over what emerges, and the power to create. And it implies both a reaching in and a reaching out, an attempt to establish connection with both the creative spirit within and the community of viewers. Hate, however, must be the result of some sort of judgment: you -- or I -- did something that I judge to be wrong; therefore I hate you -- and/or myself. Does hate also imply the lack of power or control? And doesn't hate result in a severing of connection? And is it possible that discernment could forestall or avoid hate? If we had -- or had taken -- power or control; if we had attempted to bridge differences, would the situation have turned out differently? If we had exercised discernment early on, and had worked for a creative solution, would there be hate? I'm thinking that all of this rambling discussion merely proves the old adage: a picture IS worth a thousand words! Even if I were to write a thousand words, I would not have fully tapped into the possibilities posed by this image. Because the magic and beauty of art lies in the interaction between the work of art and the viewer, not in anything I might have to say about it. Perhaps that is the difference between creativity and hate: creativity builds connections--between this artist and me; and, through this photo, between this artist and you. Hate, on the other hand, is about separation, about severing connections. 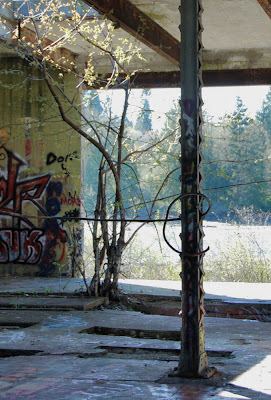 We can hate the graffiti artist for defiling this public space (though frankly it was incredibly ugly to begin with!). Or we can welcome the creative spirit into the space, and be grateful for another connection forged. Last weekend a photographer friend came to visit, and together we went out with our cameras in search of images for her upcoming show. It was a spectacularly sunny day, and we were using digital cameras, which do not have the wide exposure range you can get with a film camera, so our challenge was to find either intriguing shapes to silhouette against the sun, or a place where shade or shadow would allow our cameras to see more clearly what is lost in full sun. In the first image you see here, the light breaking into the picture casts such a strong shadow that you cannot see anything except the darkness of the shadow as it compares to the light. It is only in the second image, when we step away from the light, that we begin to see the incredible complexity of detail that lies hidden in that shadow. I have been re-reading the poems of Rumi this week, and today I read this passage from a poem called "Enough words." and there's no fixing that. The light in both these images was constant. But as we draw closer to the light, the shadows become unbearably dark, and they are all we see; they dominate our internal landscape. But the light, in fact, is always there, even in the shadow. And when we pause, completely in the shadow, long enough to let our eyes adjust, we see there is immense beauty -- or at least a lot of intriguing information -- there. Darkness has become the candle that allows you to see: that which hurts also blesses you. And when the darkness becomes too much to bear, perhaps it means the light is just around the corner. Yesterday I was blogging about the Valley. And when I mentioned that to a friend over coffee, he immediately said, "Oh, the valley of the shadow of death?" Because there is that negative connotation to the idea of the valley. 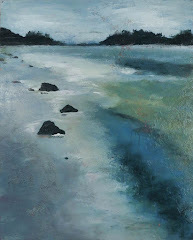 We talk of emotional hills and valleys, and always assume that the valleys are those low spots we inevitably encounter. And I found myself thinking of one of my favorite movies as a child: Shangri-La. It's the story of a plane that crashes in the high Himalayas. 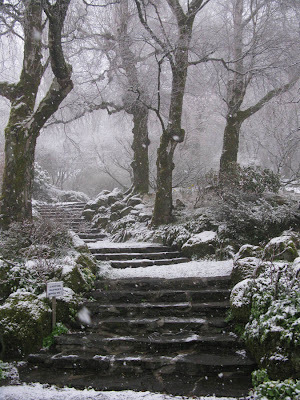 The two survivors of the crash stagger through the snow and stumble upon an incredibly verdant valley, lost to time and presided over by a wise guru/monk. And though one of the men "gets it" and chooses to stay in this timeless space, the other falls in love, and in his desperate push to return to civilization he loses everything. However painful the valleys in our lives may be, I think it is also there in the valleys, as we begin to seek our way out of whatever crash-and-burn we've just suffered, that true growth begins. It is there, in the valleys, that we find wisdom; it is there, in the quiet of the valleys, that we finally begin to hear the song of heavenly love that the angels have been singing since long before we crashed. And isn't it possible that if we rush through the valley, desperate to return to what we knew before, we will lose our chance to savor all that love and wisdom? Not that we should revel in the lows, of course. But perhaps we need to be willing to set aside our previous notions of what life was supposed to be and just stay in the moment, plant ourselves in the compost of what was and await patiently the lush green fullness that is to come. I think we've all been in that valley at various times in our lives, and it can seem, no matter how deeply this psalm is planted in us, like a very lonely place. One of the most difficult aspects of those valleys is this: what are we supposed to do with the hard stuff? How do we cope, and what hard choices will we need to make? And the choices -- what if they appear to go against everything we've been taught is right? What if we have to stop turning the other cheek? If, as Eckhart Tolle says, we have three options for dealing with what life throws us -- acceptance, enjoyment, or enthusiasm -- then what are we supposed to do with these difficult challenges? Obviously in such cases enjoyment and enthusiasm are out (unless, of course, you're a drama queen or a masochist). Does that mean we have to just roll over and accept everything life throws us? 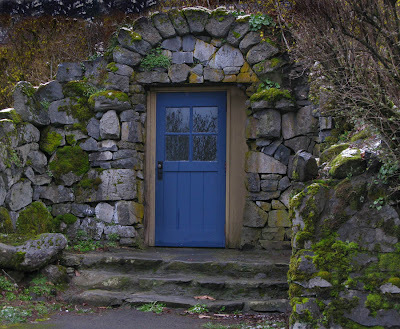 Are we doomed to be doormats? I know. It's trite. But it's always good to remember that sayings that have been around forever may have that longevity because they have some truth. So how would this saying apply when enjoyment and enthusiasm aren't viable options? I'm wondering if acceptance doesn't mean just lying down and taking it, but rather accepting that occasionally there will be stretches on our path that are very hard to walk. 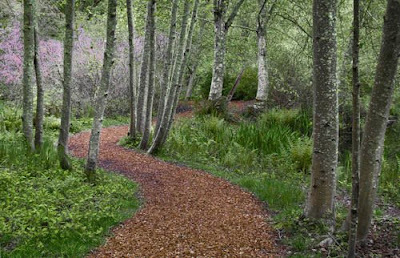 And the difficulty of that walk may not just be the circumstances that have afflicted us, but the choices and steps that WE have to take to resolve those circumstances and move forward. Sometimes the trial we have to stand is not the situation itself, but gathering up the courage to change the situation, to stand up for ourselves or for others who are being treated unfairly, or to extricate ourselves altogether. And I think the acceptance Tolle describes is not just putting up with life, but rather acceptance of our own active role in taking whatever steps are required to keep moving forward; to keep becoming whatever it is we are called to become. 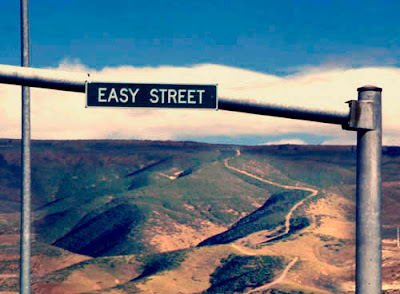 Because the fact is, we don't always get to live on Easy Street. Sometimes we have to make hard choices, step off the obvious path, and follow Jesus into the Valley. The walk may be a long one, and we may not be able to see to the end of the road; it may seem to stretch on forever, a discouraging and never-ending trudge into some unknown and possibly more difficult future. Faced with that, Easy Street, however unpleasant it may be, is at least not a lonely place, and so looks awfully appealing. But I think that if we can't enjoy it, or be enthusiastic about it, then maybe we need to accept that, for the forseeable future, Easy Street may not be the street we are called to walk. Why did the Dalai Lama laugh? The Dalai Lama has been in Seattle for the past week or so, for a conference entitled "Seeds of Compassion." A friend told me yesterday that she'd seen him interviewed on TV by some particularly sober Seattle newscaster. Apparently the newscaster asked the Dalai Lama some variation of this question: "Okay, now that we GET compassion, what do we DO with it?" and the Dalai Lama burst out laughing. So why did the Dalai Lama laugh? I was reading the Gospel of Thomas again this morning, and I'm up to Logion 21, which begins with Jesus describing his students. "They are like small children living in a field," he says, "and when the owners of the field return and tell them to leave, they take off their clothes and stand naked in the field." There are lots of ways to interpret this, but to me, this morning, it just looked like the kids didn't understand the question. They weren't asked to become naked and vulnerable, they were just asked to park themselves elsewhere. But they are so eager to please, so caught up in their own visions of reality they completely miss the point. We who long for a more compassionate universe sit at the feet of the wise but are so lost in our internal drama we can't see either each other or the stage. Because compassion isn't about DO-ing. It's about BE-ing. What we DO is what we have always done: we work, we drive, we shop, we eat, we weed our gardens and tend our sheep, interact with our fellow workers, neighbors, family and friends, vote, worship, sing in the choir or read the newspaper, walk in the forest or surf the web, work out at the gym or write up contracts... but we DO all these things WITH COMPASSION. Perhaps what the interviewer was really asking was this: But what does doing things with compassion LOOK like? My guess is that the answer has something to do with paying attention, with being aware that there is more going on around you than just the thoughts inside your own head, with being conscious of the connecting threads that hold us all together in the delicate web of life. Which means, I think, that when we work, we pay attention to our fellow workers, do our part to the best of our ability, and try to be conscious about the end result of our labors: what would most benefit those who use our service or buy our product. When we drive, instead of always rushing and pushing and cutting in front of other drivers, or blithely weaving in and out of lanes while talking on our cellphones, we pay attention to other drivers, stay aware that they, too, are probably in a hurry, and attempt to strike a fair balance between their need to push forward and our own. When we shop, we can stay conscious of what we are buying and what effect that purchase can have on our own lives, on the economy, on the environment... do we need this or just want it? Are we buying local? Is the packaging biodegradable? When we interact with others, we can listen as well as speak, hear not just what they are saying but what lies beneath; come to the conversation with information and ears, but be willing to set our agendas aside. When we vote, vote for what we honestly believe is best for all, not just the candidate who will support our particular project or point of view. Whether we walk in the forest or surf the web, work out at the gym or write up contracts, if we are BEing compassionate, we are paying attention, waking up to the effects of what we are doing, both on ourselves and on those around us. So why does the Dalai Lama laugh? Because the point is so simple: just wake up! Pay attention! Listen to what is being asked or said, and take appropriate action. And yet, like the children in the field, we often just don't understand the question. We go to ridiculous lengths to LOOK like we get it, but we don't take the simple steps that are asked of us. Caught up in the often bizarre fantasies that play inside our own heads, driven by the desire to please, or to win, or to get what we want or need, we fail to hear or see or move in concert with that which surrounds us. 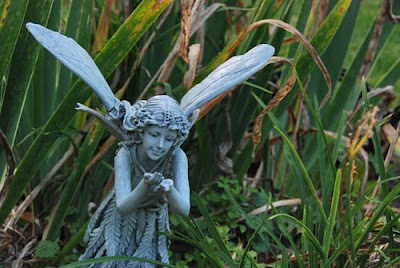 Compassion calls us to notice, to listen and respond. But for us humans, lost in our own self-constructed vision of the universe, it's probably the most challenging task we can possibly set for ourselves. This morning I was reading Jesus' parable of the mustard seed. The particular commentary I was reading suggested that one way of interpreting the parable is to discover that in each moment lie the seeds of a new beginning. It seems to me that that's true on at least two levels. Practically speaking, a decision or action taken in one moment can have huge consequences in the next, or just over time. 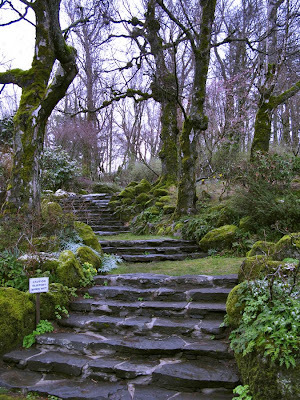 But that expansive seed-to-tree quality can also happen in the space of a moment if I am fully present to the moment. I have definitely had those experiences where time seems to expand infinitely, or a single thought opens a multiplicity of possibilities. But before that unfolding can happen, we must first develop an attitude of attentiveness -- which is why there are times when just holding a camera allows you to see what you might otherwise have missed. These two photos are a case in point. I had a friend visiting this past weekend who is also a photographer. She has a show coming up, so we found ourselves driving around the island on a brilliantly sunny day looking for photographic opportunities. I hadn't been able to find my favorite infrared filter (it would have been a perfect day to shoot infrared) and Waterfront Park was crawling with people, so I took her to the almost-always-abandoned bunker that sits on a beach at the south end of the island. Once inside the bunker, I realized that the tree that has somehow managed to take root in the cement floor was in bloom -- an amazing symbol of hope, growing out of a space that presumably once held guns to protect the harbor. 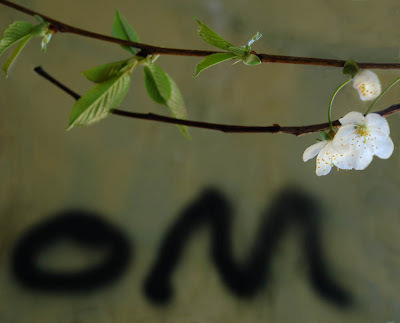 And then, zooming in on the blossoms, glowing against the background of graffiti, I discovered this wonderful juxtaposition. You could probably claim that both photographs have value; even that the first has a clearer statement than the second. So why do I prefer the second? Partly, of course, because the first is so busy; I much prefer the simplicity of the second. But it's also because in the long run the message of the first, though it seems powerful initially, feels pretty trite to me. There is a level of observation where we can easily get stuck (and I often do) looking at or pointing to the more obvious messages that indicate there are redemptive capabilities lurking in the world around us. But once you know that, what do you do? 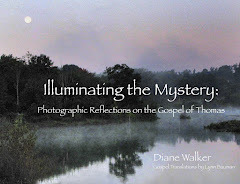 A photographer or spiritual seeker who contents herself at that level is almost like a chronic dieter: you find a good diet, or image, or practice; you stay on it for a while, then drift away; and then you realize you've drifted and find another. But what happens if you zoom in, focus on the moment, look for the seed of the moment? I think that level of attention has the capacity for passion that you can find in a good marriage. Simply by making the choice to stay, to commit, to explore, there is something more deeply rooted that can grow and blossom more fully than a thousand one-night stands. And every moment offers us that choice: to click and walk away, or to stay with it, step into it, look deeper, and find the infinite fullness that lurks within. With that level of attention, the bread and fish that were meant to feed but one can expand to feed 5000. The single seed can grow to a tree that hosts and feeds a hundred birds. It is that capacity that lurks in every moment. And I think it's possible that what Jesus was trying to tell us in his parable is that it's that fullness, that sense of possibility that emerges when we stop and step into the now, that is the root of what it means to be in heaven. There was a small pond across from the dining hall at the retreat center last weekend, and we were all astonished to discover that there were fish surviving in the pond despite the cold weather. 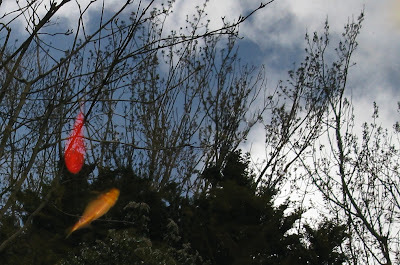 I attempted to photograph them several times, but was never quite able to get the photograph I wanted: there were just too many dimensions -- the branches above, the surface of the water, which reflected the sky and trees above the branches, and the fish below -- and there seemed to be no way I could get everything in focus. ... and isn't that a wonderful metaphor for the challenge of living a spiritual life? I want so much to live consciously, to be attentive to the moment, to the call of the divine, to the needs of those around me, to my body, to the spirit within my body, and to the challenges of daily living. But I just can't seem to keep everything in focus. 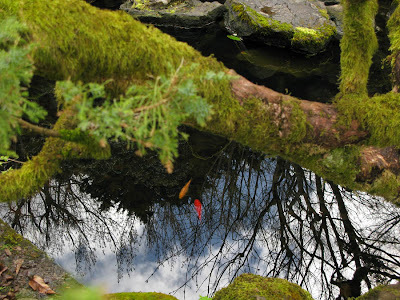 If I attempt to focus on that within me, I find on closer examination that I'm really only seeing the surface -- and even that is just a reflection of my surroundings; what lies beneath is still pretty fuzzy. And if I get too caught up in trying to see down into it, I risk bumping my head against the reality right in front of me. Perhaps it is only God who can percieve all these dimensions with clarity. 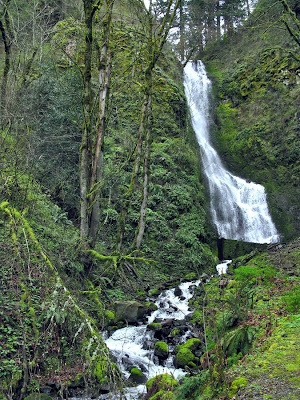 And if we were not caught on that awkward precipice between human and divine, we might not be spending so much energy trying to encompass it all, but be content to just swim happily in our little ponds, our only job to stay fed, to avoid the hungry herons and raccoons, and to nestle down into the warm mud on cold days. In A New Earth, Eckhart Tolle tells the story of a man whose mother had been unable to properly care for him. The longing and the fury that resulted from that experience manifested itself in his adult life as a pattern of seduction and rejection: He became an expert at charming women, but as intimacy developed his fury with his mother would sabotage the relationship. I see this hot and cold pattern in my own life, but because I have issues with both parents it takes a different form as issues with authority. Often in situations, both at work and elsewhere, I will exhibit a desperate need to please whatever person I perceive as an authority figure -- which makes me a very useful employee at one level. But when the authority figure fails to live up to my ideals, the anger I feel is often out of proportion to the actual "sin" committed, and manifests itself as a sense of having been betrayed "yet again." So what does any of this have to do with this image, which for some strange reason is one of my favorites to come out of my weekend on retreat? I think each of us has a pattern we struggle with -- what Tolle calls the painbody -- and that the struggle manifests itself as a constant cycle of death and rebirth, of trust and betrayal, of longing and fury. There is something in us that keeps that cycle going, because our egoic identity is somehow fed or reassured by this pattern. And it seems to me that religion and society both give us messages that make it difficult to extricate ourselves. If we attempt to shield ourselves by NOT trusting, we are accused of being cynical, or "not nice"; with the implication that failure to trust humans is a failure to trust God to take care of us. So we become like Charlie Brown, always wary, and yet, in the end, we take the plunge, run forward again to kick the football, thinking that is an act of faith. And then, at the last moment, some Lucy in our lives jerks the ball away and we fall flat on our faces yet again. We who live outside the comic strip shake our heads when we see it coming, and wonder when Charlie Brown will take his football and find another friend. Even Charlie Brown understands that he has been foolish to trust again, and berates himself. But he is stuck in his pattern: I suspect it might be easier for him to go in for the kick knowing the ball will be pulled away and he will not actually have to run after it and enter the game; easier to stay with the known than to embark into the unknown. Which may be why this image is so moving. We see all the youth and beauty of the daffodil, and it resonates with the hope that lies within us. At the same time, we see it defeated by the snow, face down in the dirt, and are haunted by the chill of that brokenness, by the inevitability of failure, loss, and death. Perhaps I love the image because it doesn't stop here for me. 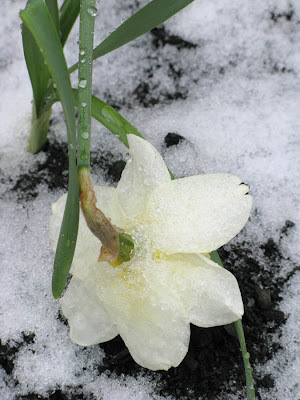 I saw the same daffodil the next day, after the snow had melted, once again turning its face to the sun. 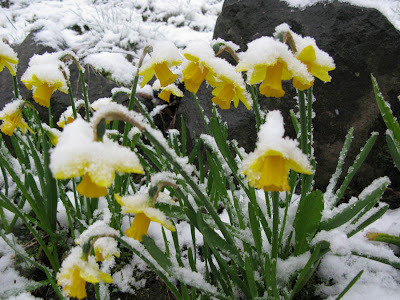 Because I am not the daffodil I have the objectivity to know the snows will melt. I also know that eventually the flower will die. And I know a new flower -- or several -- will arise from its bulb next spring. Perhaps, like the flower, we are hopelessly rooted to one spot in the garden. Maybe our only job is to endure the relentless cycle, to bloom where we are planted, endure the snows, and die. 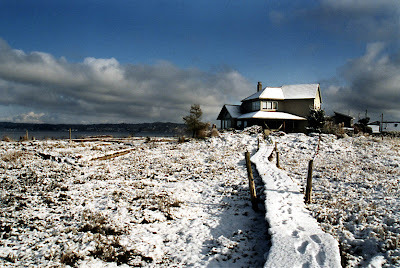 But when I look at this image, what stirs in me is the Mystical Hope that first led me to the teachings of Cynthia Bourgeault; the awareness that there is a life force that continues to flourish in us despite the snows; that there is a divine unity that calls to us, longs for us and thrives in us, and will never cease to reach out to us in yearning, drawing us back into the universal garden that is love. 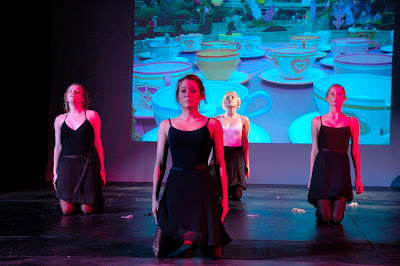 I have been in rehearsals this past month for a musical production of "Secret Garden" -- that wonderful children's book so many of us read long ago. I've loved the rehearsals: the music is incredibly moving -- rather like the story itself -- and our director has informed us that she sees the whole production as a metaphor for the secret garden that lives within each of us. 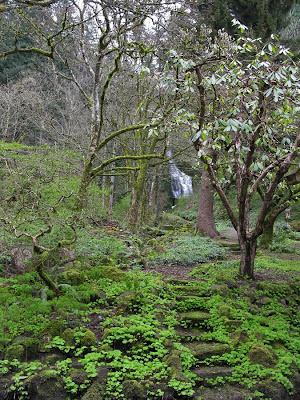 Going on a meditative retreat is always a bit of a mixed blessing for me. I love the peace and the stillness, the freedom from the daily grind; love being fed and housed in a way that frees me from my daily responsibilities of feeding and housing in my own life. And I love the sense of renewal and purpose that emerges from these times apart. What is always difficult, however, particularly in the case of a silent retreat, is the pain of watching my reaction patterns; of seeing how my shadow begins its relentless spin into dark projections as I cope with the challenges of entering new situations and meeting new people unprotected by the masks of language and activity. The ups and downs of this year's shadow dance were perfectly mirrored by the weather we experienced: daily bouts of snow and hail were leavened with bursts of sunshine and blue sky, and the darkness of the afternoon clouds served as a perfect backdrop to the occasional streaks of light. 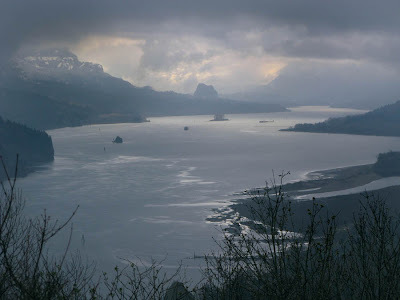 The particular location of this year's retreat, the Menucha Conference Center, overlooking the Columbia Gorge in Oregon, was spectacularly beautiful throughout the full range of light and weather, so, as is often true for me, I took refuge behind the camera lens, endeavoring to listen for the Word through my eyes. Today I am slowly walking through the results of my labors, some of which are posted here. But ultimately the gifts of the retreat -- beyond the obvious restorative properties of time away -- were two-fold. The first gift lay in the discovery that, for this time at least, the blessing of a regular meditative practice adhered to throughout the year has resulted in a steadier state for me, so that the highs and lows were less pronounced and there was an even-ness to the time that helped me to be more aware of the combined energy in the room and less concerned with my own foibles. More importantly, though, I came to understand that the depth of my striving to release the distractions of my constant mental chattering and get in touch with the Divine is more than matched by the Divine's yearning to reach out to me in return. Each time I remember why I am here, stop the chatter, and return to that inner space, it is the Divine which facilitates that moment of metanoia, of transformation back into oneness. The shift happens because God's yearning for me is every bit as piercing as my yearning for God. And if I can remember that, it seems to me that this road I am traveling will seem far less difficult and much less lonely. 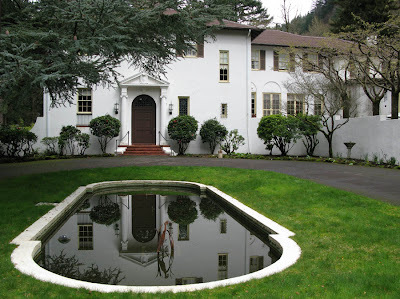 I spent this past weekend at a Centering Prayer retreat near the Columbia Gorge in Oregon, and during one of my afternoon breaks I went to visit the Franciscan sisters who used to run the store and the ferry dock on Shaw Island. 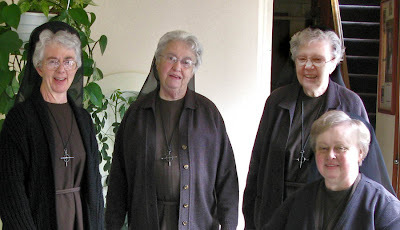 The four of them -- from left to right, Sister Dorothy, Sister Helen Jean, Sister Catherine, and Sister Kateri -- now live in a lovely Italianate mansion in Bridal Veil, Oregon, with a magnificent waterfall that cascades down the cliff above the house, sending its waters through an enchanting network of ponds and streams that embraces the property. It was wonderful to have a chance to visit with them and catch up on old times: they look and seem the same to me, though it's been several years since I saw them last. I would not have known (had she not told me) that Sister Catherine had a stroke last year; she seems well on her way to recovery, and is back teaching little ones at the Montessori School in Portland. 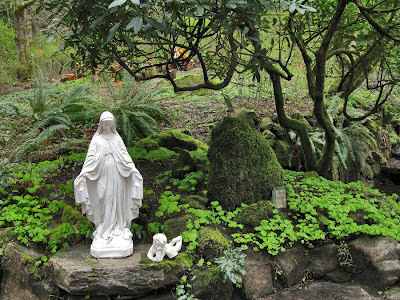 Sister Kateri teaches music at that same school, Sister Helen Jean manages the school's accounts payable, and Sister Dorothy divides her time between teaching English as a second language and working at The Grotto in Portland. 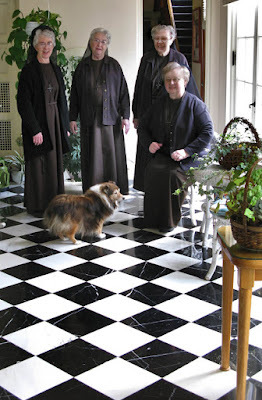 Sister Kateri's little sheltie, Connie, is still very much with them -- she's FIFTEEN now! -- and appears not to miss her old job of greeting the ferries. She shares guarding responsibilities with two little white poodles and Sister Dorothy's cat, who bears a VERY strong resemblance to our own Alex, both in looks and personality. As we sat in the kitchen after our tour of the grounds, drinking perfectly brewed coffee and feasting on chocolate and delicious Italian anise wafer cookies, with the view of the falls through the kitchen window and the susurrant rush of that water humming in the background I felt the poignancy of that old French proverb, Plus ca change, plus c'est la meme chose: the more things change, the more they stay the same. It's been many years since I left Shaw, our first island home, and yet the connection to these dear sisters remains strong. I know we approach our faith from different places on the religious spectrum, but I feel nonetheless that it is our shared belief as well as our shared past that continues to weave our lives together.